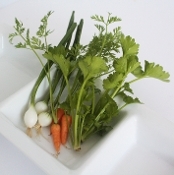 Tiny Veggies™ are a unique and exciting line of miniature veggies that can be used as garnish or side dish. They can be served fresh or cooked in various ways. Extremely versatile, these little jewels will make your presentations really stand out! Colorful addition to appetizers, crudite platters and are a crunchy float on a cream soup. Tiny Veggies™ come pre-washed. All are 50 pieces per container. Dark red, tiny beets with dark burgundy & green leaves attached. Sweet & earthy beet taste. 50 Ct.
Crunchy, sweet garnish; Fantastic flavor; Tiny Veggies™ Carrots are 1/2" in length. 50 Count. Tiny Cucumbers that resemble tiny watermelons! Great juicy melon flavor. 50 Count. Frilly green leaves with tiny stalks; Intense licorice flavor. 50 Count. Fresh, robust leek flavor. Delightful addition to soups and appetizers. 50 Count. Traditional French Base for cooking: TV Celery, TV Onion & TV Carrot Mix. 50 Count. 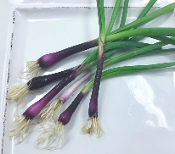 Vibrant white colored roots with bright green curly tops. Spicy, fresh mustard taste. 50 Count. 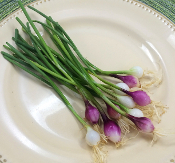 Tiny purple & white bulbs with bright green stems. Intense onion flavor. 50 Count. 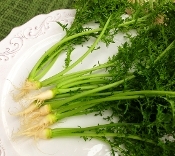 Cream colored, carrot shaped veggies with bright green stems & leaves attached. Sweet, nutty, earthy flavor. 50 Ct. Fantastic assortment of colors, including red, yellow, purple & orange. 50 Count. Spicy, attractive & crunchy. Bursting with fresh radish flavor. Bright red & pink in color. 50 Count. Reddish-purple veggies with green leaves and tiny white roots attached. Flavorful onion flavor. 50 Ct. Cute, assorted tiny squash with yellow & green colors. Great squash flavor. 50 Count. Tangy, vivid turnip flavor. Pink & white colors with green leaves attached. 50 Count. Tiny Veggies™ Crudite Mix is a sampling of our most popular Tiny Veggies™! 50 Count.